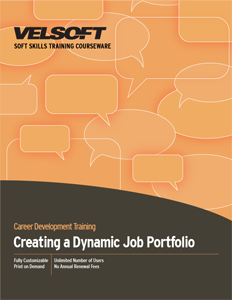 Job Portfolio Training Material for trainers to teach employees how to create dynamite job portfolios! Confidently teach supervisors and staff how to prepare résumés, cover letters, the essential components of the portfolio and more! Seeing is Believing This sample manual to teach Creating a Dynamite Job Portfolio is in MS Word format. The job market continues to change, as does the way we look for work. Job Portfolio Training Material examines the value of presenting their self as a complete package by using a resume as an introduction to an employer and backing it up with a portfolio presented at the interview. Start creating a dynamite job porfolio today!